This started out as just a Steam review but I wanted to post due to the fact I enjoyed the game so much. But after the second paragraph, just after finding out that the Devs are releasing Season 2 in the coming year after a successful kickstarter, I realized that this is a game I want as many people as I can tell to know about. Just adding another positive rating to the already existent mass of them would be as helpful as getting a windmill to spin by blowing on it. So let’s do a full review, published courtesy of Fextralife so I can waste your time tell you about a pixel styled, point and click adventure game, so you can waste spend your money on it. This is probably one of the funniest adventure games I’ve ever played and has got me back into occult fiction and fantasy. This is a mix of Ghost Busters and the X-Files, added with two thirds of the three stooges. It’s silly, spooky, laugh out loud fun and deserving of more investment, and no I am not a member of the dev team or affiliated with them in any way, but yes you should give them lots of money. If you have little to no interest in occult fantasy, buddy cop comedies, pixel graphics, or point-and-click adventure games, then I’m sorry to say you have lost approximately fifty seconds of your life reading the introduction to the review of a game you probably won’t want to get anyway. If you do, then let’s begin. 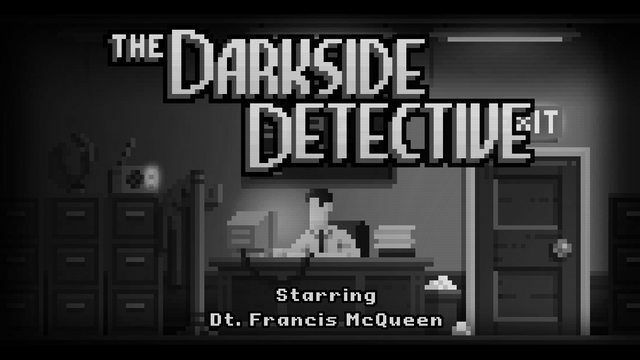 The Darkside Detective tells the story, or rather many stories by Francis McQueeen, a seeker of the occult and eldritch as well as an investigator of all things paranormal and supernatural. Teamed with his goofy cop sidekick, Officer Dooley, Detective McQueen investigates multiple cases dealing with some form of ghostly apparition, crazed cultist, demonic entity, or cryptic creature. Despite its many horror themes and monsters, this game is a satire through and through, making fun of everything horror B-movies have tried to scare audiences with. It’s filled with parodies of various popular horror flicks and myths. The satire, however, is really only a small facet of the comedic hilarity, as The Darkside Detective excels with its writing of ridiculous characters, situations, with plenty of jokes and jabs, that revolve around what is terrorizing New Yor-I mean Twin Lakes at the time being. Twin Lakes is a city rife with crazy paranormal encounters, and equally crazy (if not more so) people to deal with. Its a bevy of kooks and weirdos who range from a pyromaniac eight-year-olds, a paranoid anti-government sea monster, An occultist train engineer, a rival detective so douchy he literally takes candy from babies (then fines the baby for crying about it) and more. It’s just…a mess, a beautiful mess of madness that makes progressing through each story a treat, with dialogue so funny that I want to interact with every possible thing just to hear it all, and everything seeming to have some kind of oddity or quirk just to make it all that much stranger. I could go into further detail on each individual story, but honestly the best experience with this game, is going in blind. Truly it’s the storytelling and writing that makes this game fantastic, as it seems to be for the most part of these classic adventure games. If my mother had that much storage space in her closet, she’d still run out of room by the end of the month. It’s the major selling point, and what I most loved about The Darkside Detective. I wish I could say more, but unlike thoroughly explaining gameplay, visuals, audio, and all other more technical components of a game, story and humor are some things you can’t go into full detail without spoiling the plot, or weakening the experience compared to a first time playthrough. 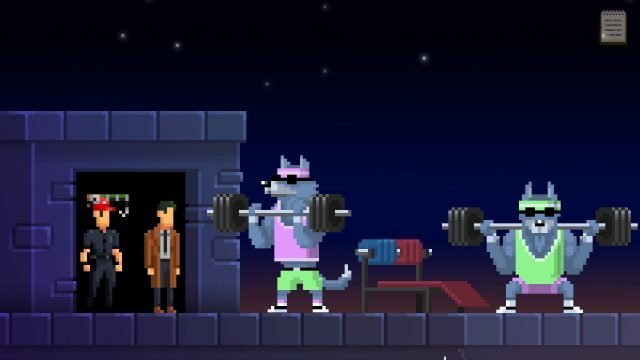 Again, if you enjoy buddy cop comedies, Ghostbusters, and horror movie satire, this is a sure thing, heck, even if you don’t like point-and-clicks, I would still say get a guide and play through it like that, cause the humor is top notch. Simple at times, witty at others, but splendid all around. Not every joke was equally funny, but there wasn’t a single one that didn’t at least put a smile on my face. Simplistic, is one word I could use to sum up the pixel art style and colorful is another. Blocky, square, and geometrically appealing are a few more. 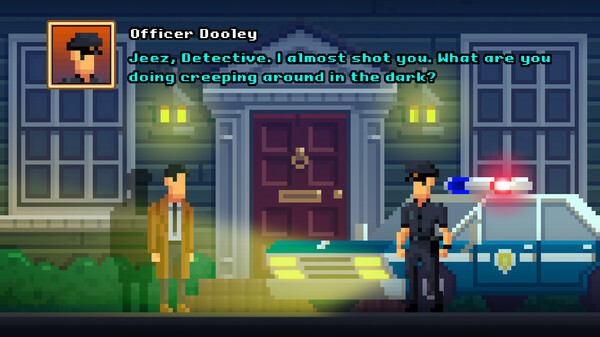 “The Darkside Detective’s pixel graphic style lends a nostalgic return to classic point and clicks of old, that is reminiscent of titles such as Monkey Island and Dark Mansion” is a pretentious sentence I could also use to describe the art style. 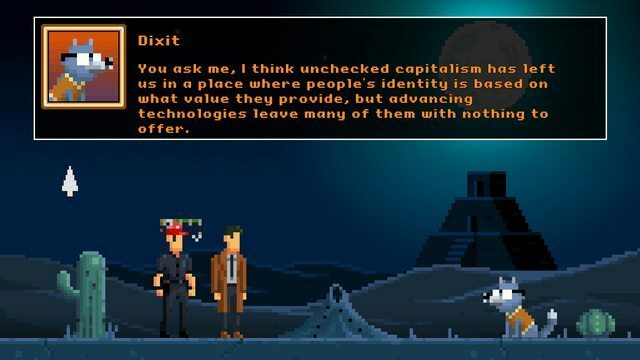 However, when it comes to pixel art, there only three things I, and likely what most people care about. There are no words to describe how I feel about this. Does it look nice? Can you tell what’s going on and what’s what? And will it possibly give me an epileptic seizure? To all these questions I can pretty much answer yes, yes and you may want to consult your doctor about that. 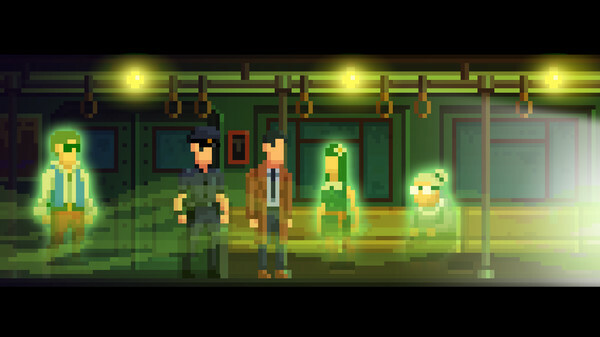 Really though, given the decades of practice game development has had in 2D pixel art, I think it should be the basic standard for any pixel game to look “nice”, decent at least, and The Darkside Detective has certainly accomplished that. Though simplistic to the point of not having facial features for most characters outside of facial hair, and hardly any dynamic animations, the game looks vibrantly colourful, and is especially beautiful at certain points in the story. It’s…like a child’s drawing actually, made into pixel form. Lots of strong, crayon colors, simple details, and some cartoonishly designed characters. which is quite fitting given the game’s comical nature. But this is a quite an important feature that can damn a point-and-click pixel game into the nine circles of game development hell. If a pixel game’s standard is to look attractive, then knowing what anything and everything is at a glance should be the barest minimum. This is so I can tell the difference between a baby rattle and a bomb so I don’t accidentally recreate a morbidly dark version of a loony toons skit. So, how hard is it to tell what the hell I’m looking at and clicking on? I’m happy to say, hardly difficult at all. Unlike some point-and-click titles, this is one where I can tell exactly what’s what and who’s who. Pretty much everything of interest is definable from the background and usually large enough and colorful enough to catch the eye. Anything that doesn’t easily stand out can be found with a little mouse waving. The point is, I never had a “What the $&%! Am I looking at? !” moment, or ever got stuck because the thing I needed to find was so obscurely hidden in a mess of visual clutter, so that it ended up being a hidden object game on top of a logic puzzle. Finding things was fairly easy, and the game hit that sweet spot of being visually interesting and fun, but not so much so that I ever got sick and confused from looking at it. 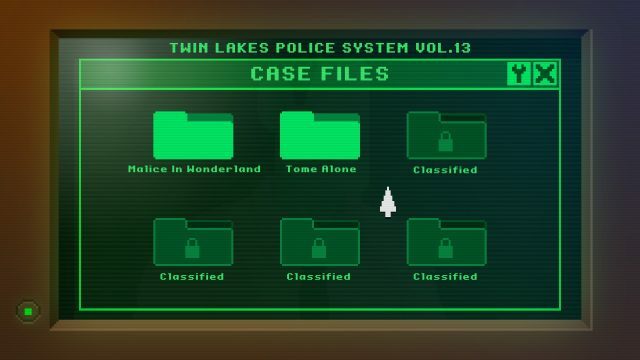 The game’s visuals are neither boring nor over stimulating, and the valuable items are easy to distinguish with a little looking at the most, giving the Darkside Detective a pass and thumbs up in its visuals department. While I do admit some more dynamic animations would have be welcomed, I can’t say there was any point in the game when I didn’t enjoy what I saw on my screen. When it comes to audio, yeeeeah, don’t expect award winning vocal performances because as well as having no mouths, no one has voices either. Does this bring down the game? Well if you hate reading of all kinds, then yes, yes it does. However, if you do enjoy the written word as well as or even more than the spoken, then you’ll have no problems here. For me, the silence is actually preferable in this case. The lack of vocal sound leaves one in a quieter atmosphere, as well as it draws more focus on the music, which I’ll get to in a minute. Also, personally, I would bet that the voices the devs would get for the characters if they did, wouldn’t be as good as the ones imagined in my head. As for sound effects, they do their job, quite minimal and only occur during certain events such as putting out a fire but are well used as they do add to the scene or action. I can’t really complain about nor commend the sound effects, but given how little significance they have to the game as a whole, I don’t think it really matters. In a more action focused game, this would be a problem, but in an adventure title having sound only when something’s happening is probably for the best. Having constant, distracting noises would probably just get annoying over time, and like I said, when they do occur, the sound effects do add something, so they’re not a waste. Finally and most creepily, you have the music. If the voice and sound effects were largely ignored to focus on the music, then I have to say it was a smart choice. Simply put, the music for this game in fantastic, a beautifully fitting soundtrack of creepy and spooky pieces, paranormal and ghostly in tone and execution, amplifying the horror side of this horror comedy. Each song a similar yet unique brand of subtle horror, not truly scary or spine chilling in the sense of wandering around an empty house with Michael Mires walking in pace right behind with that classic Halloween music playing. It’s more on the side of what you would hear in say a supernatural mystery documentary, or a ghost story narrative such as tales from the crypt. It’s whimsical, with a good deal of creep factor, not to cause terror, but to draw one into a state of calm eeriness. It’s somewhat enchantingly haunting all at the same time, more serene than disturbing, in a way that soothes the nerves rather than putting them on edge like the aforementioned Michael Mires theme music. It also gives the feeling that something’s not quite right, that proper paranormal vibe like a specter may be looming over you. As a point-and-click adventure game, the biggest thing you would want to know is this “how hard is the gameplay?” Because when it comes to games like these, difficulty can range from being fairly easy, just click the big shiny red button with “press this” in big, bold letters. To being more challenging in terms of gameplay with “you better have a detailed walkthrough on hand cause this will be like figuring out the Divinci Code, upside down, in a bad translation of J.R.Tolken Elvish speak…………and the paper’s on fire”. Thankfully, the Darkside Detective is not the latter and far from it. The answer to this conundrum is easier than you think, though it does require extensive understanding of fourth dimensional quantum physics. The puzzles are on the easier side of the scale, with the majority of puzzles giving strong hints as to what you need to do and what does what, as well as being largely involving “use this on this” style of puzzle solving. A staple of point ‘n’ clicks, with a few fun little mini games such as clear the tiles, make a pipe chain, or connect the wires without crossing them. Most of the use this on this puzzles usually took but a minute to put two and two together, after finding the needed objects. The only times I ever got stuck was because I didn’t know exactly how to use the items and on what. This was largely due to not knowing what order certain things had to be done in, but even then, that was only during a few problematic minutes. Only once did I ever run into a situation where felt particularly stuck which I feel is worth mentioning. This happened due to an arbitrary order of operations where in this particular instance I had actually worked out what I had to do, before clicking on the hint that would lead me to the action. Aaah, if gamers of the past could see us now. Futuristic graphical technology that can render beads of sweat dripping off of a realistic swimsuit model, and we’re still playing games you could run on a calculator. Aside from that, the gameplay is, admittedly pretty average, though I did find the occasional mini game quite colorfully fun and a welcome exception to the standard point ‘n’ click affair. The puzzles that had logical solutions were in no way hard, and any puzzles whose sensibility and reasoning deviated from common logic were clearly explained. I never really encountered a situation where I’d solve a puzzle and then say “how the hell does that make any sense? !”, or, “how the hell was I supposed to figure that out? !”, or “how many drugs were these developers taking to think this up? !” And you know what? That’s the way I like it. The puzzles are easy but not too easy, thus giving quite entertaining and not too frustrating obstacles between plot segments or events. The short length of each case (level as it were) makes it so that they don’t get stale before the next case, and helps change things up a bit. 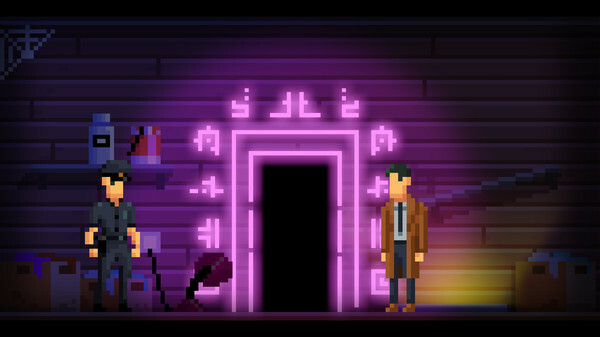 The Darkside Detective isn’t revolutionary, it isn’t mind blowing and it isn’t a brain buster. However it succeeds where it matters most, it’s fun. It’s fun to look at, it’s fun to listen to, it’s fun to watch, it’s fun to read, and it’s fun to play. 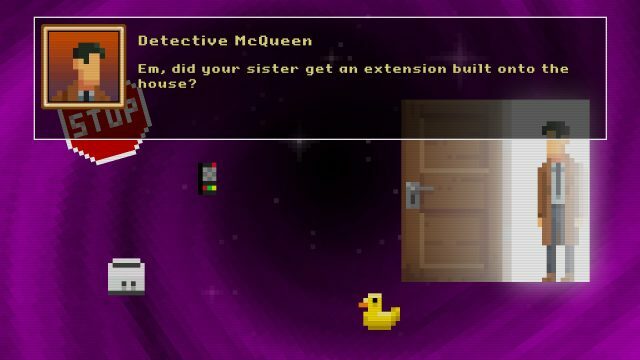 From start to finish, I had a great time playing this wacky little game and enjoying all the humor, mystery, and added spookiness that it had to offer. While I can definitely see room for improvement, this is still a solid experience as it is, and I wholly recommend it to anyone who wants a light-hearted adventure into the world of the supernatural and occult. However, though the find and use puzzles are a common staple of the point-and-click genre, I do genuinely think they’re becoming too common place in gameplay in these games. I would rather see more of the kind of puzzles that diverge from the well-treaded design. In The Darkside Detective these worked well to a certain extent, but it was the puzzles that didn’t have them, that really stood out for me, even if they were ones not completely original. 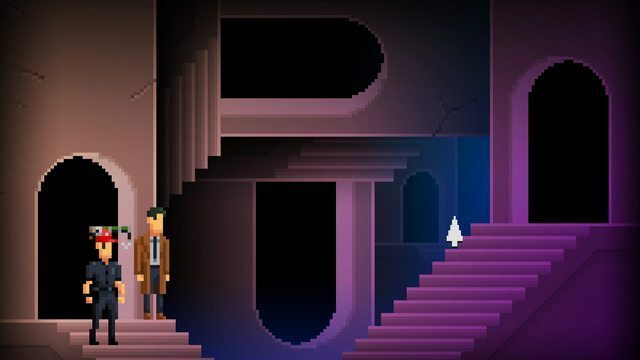 I much prefer adventure games with clear, simple, logical puzzles rather than the extremely obscure moon logic puzzles the “classic” adventure games present me with, and you know why? Cause that’s not what I playto adventure games for. I come to them for enjoyable, entertaining stories as well as characters with clever dialogue, colorful plots, and interesting worlds to explore. That’s exactly what The Darkside Detective gives players. If you enjoyed this review be sure to read more with our latest thoughts on action shinobi Sekiro Review: Shinobis Die Many Times. Or you can check out Capcom’s demon hunting title Devil May Cry 5 Review: Ssstylish Perfection. 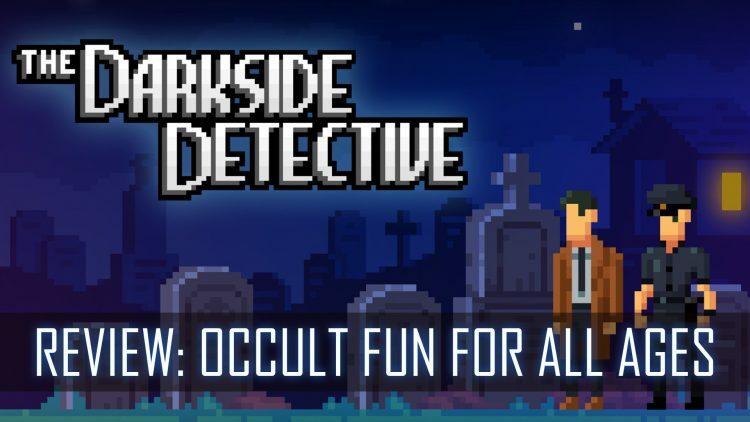 Summary: The Darkside Detective is a entertaining point 'n' click that combines imaginative characters and witty dialogue. Not to be missed for it's creative storyline, variety of puzzles and eerily intriguing soundtrack.